My kiddos love waffles. Here are some of the concepts that we have discussed during breakfast with waffles. Hot or cold? – When my youngest was teething, she would not chew on any of the teething toys that we had. I did some research online and saw a recommendation to use frozen waffles. We tried it, and she loved it! The funny thing is that my oldest is the main one who requests to eat cold frozen waffles. Shapes – Waffles come in many different shapes and sizes. We talk about squares, circles, and diamonds (the mini waffles form a diamond-shaped hole in the middle). 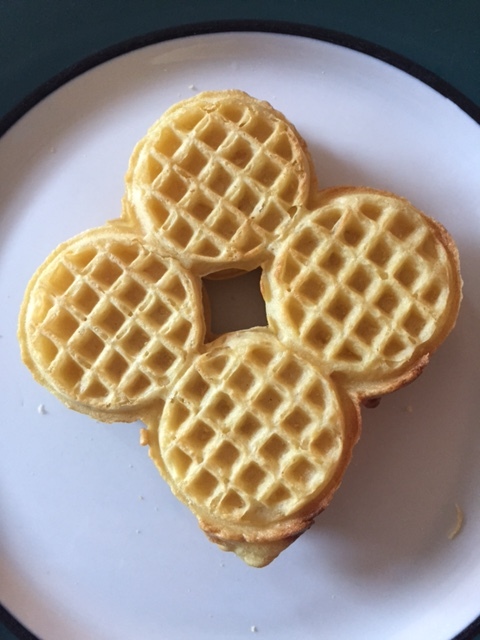 Fractions – I like to buy the mini-waffles (as pictured above) because it is an easy way for me to model the concepts of whole and half. When they get a little older, I can also talk about 1/4 and 3/4 and even mixed fractions (“I’d like 2 1/4 waffles”). Prepositions – Ask them where they want the syrup. On the top, underneath the waffle or beside it? I also use sectioned plates so that I can offer to put syrup in the smallest section so that they can dip the waffles in the syrup. What are some other concepts could I teach with waffles? ← Shall We Clean the House? Sometimes we cut waffles (or other similar foods) into shapes like letters or numbers. You could probably have fun counting waffle sticks too. For older kids you could tally with them. Cookie cutters might allow you to cover an even wider variety of topics! Building off your shapes idea you could probably make a small waffle tangram. Great ideas… teachable moments are everywhere! I love all of your ideas! We haven’t used cookie cutters too much, but I think I’m about to change that! What have been some of your favorite teachable moments? I agree…our attitude towards things really sends a message to our children. Being positive can go a long way!